​Electric currents in the vastly complex system of billions of nerves in our body allow us to sense the world, control parts of our body, and think. These are representative of the three major functions of nerves. First, nerves carry messages from our sensory organs and others to the central nervous system, consisting of the brain and spinal cord. Second, nerves carry messages from the central nervous system to muscles and other organs. Third, nerves transmit and process signals within the central nervous system. The sheer number of nerve cells and the incredibly greater number of connections between them makes this system the subtle wonder that it is. Nerve conduction is a general term for electrical signals carried by nerve cells. It is one aspect of bioelectricity, or electrical effects in and created by biological systems. Nerve cells, properly called neurons, look different from other cells—they have tendrils, some of them many centimeters long, connecting them with other cells. (See Figure 1.) Signals arrive at the cell body across synapses or through dendrites, stimulating the neuron to generate its own signal, sent along its long axon to other nerve or muscle cells. Signals may arrive from many other locations and be transmitted to yet others, conditioning the synapses by use, giving the system its complexity and its ability to learn. ​The method by which these electric currents are generated and transmitted is more complex than the simple movement of free charges in a conductor, but it can be understood with principles already discussed. The most important of these are the Coulomb force and diffusion. This figure illustrates how a voltage (potential difference) is created across the cell membrane of a neuron in its resting state. This thin membrane separates electrically neutral fluids having differing concentrations of ions, the most important varieties being Na+, K+, and Cl– (these are sodium, potassium, and chlorine ions with single plus or minus charges as indicated). Diffusion, Osmosis, and Related Processes, free ions will diffuse from a region of high concentration to one of low concentration. But the cell membrane is semipermeable, meaning that some ions may cross it while others cannot. In its resting state, the cell membrane is permeable to K+ and Cl–, and impermeable to Na+. Diffusion of K+ and Cl– thus creates the layers of positive and negative charge on the outside and inside of the membrane. The Coulomb force prevents the ions from diffusing across in their entirety. ​Once the charge layer has built up, the repulsion of like charges prevents more from moving across, and the attraction of unlike charges prevents more from leaving either side. The result is two layers of charge right on the membrane, with diffusion being balanced by the Coulomb force. A tiny fraction of the charges move across and the fluids remain neutral (other ions are present), while a separation of charge and a voltage have been created across the membrane. The separation of charge creates a potential difference of 70 to 90 mV across the cell membrane. While this is a small voltage, the resulting electric field (E = V/d) across the only 8-nm-thick membrane is immense (on the order of 10 MV/m as we mentioned earlier) and has fundamental effects on its structure and permeability. Now, if the exterior of a neuron is taken to be at 0 V, then the interior has a resting potential of about -70 to –90 mV. Such voltages are created across the membranes of almost all types of animal cells but are largest in nerve and muscle cells. In fact, fully 25% of the energy used by cells goes toward creating and maintaining these potentials. PEMF THERAPY DIRECTLY CHARGES CELL MEMBRANE POTENTIAL THUS HELPING TO ENERGIZE THE BODY AND HELP THE BODY TO CONSERVE ENERGY. Electric currents along the cell membrane are created by any stimulus that changes the membrane’s permeability. The membrane thus temporarily becomes permeable to Na+, which then rushes in, driven both by diffusion and the Coulomb force. This inrush of Na+ first neutralizes the inside membrane, or depolarizes it, and then makes it slightly positive. The depolarization causes the membrane to again become impermeable to Na+, and the movement of K+ quickly returns the cell to its resting potential, or repolarizes it. This sequence of events results in a voltage pulse, called the action potential. (See Figure BELOW.) Only small fractions of the ions move, so that the cell can fire many hundreds of times without depleting the excess concentrations of Na+ and K+. Eventually, the cell must replenish these ions to maintain the concentration differences that create bioelectricity. This sodium-potassium pump is an example of active transport, wherein cell energy is used to move ions across membranes against diffusion gradients and the Coulomb force. The separation of charge creates a potential difference of 70 to 90 mV across the cell membrane. While this is a small voltage, the resulting electric field (E = V/d) across the only 8-nm-thick membrane is immense (on the order of 11 MV/m!) and has fundamental effects on its structure and permeability. Now, if the exterior of a neuron is taken to be at 0 V, then the interior has a resting potential of about –90 mV. Such voltages are created across the membranes of almost all types of animal cells but are largest in nerve and muscle cells. In fact, fully 25% of the energy used by cells goes toward creating and maintaining these potentials. This sequence of events results in a voltage pulse, called the action potential. Only small fractions of the ions move, so that the cell can fire many hundreds of times without depleting the excess concentrations of Na+ and K+. Eventually, the cell must replenish these ions to maintain the concentration differences that create bioelectricity. This sodium-potassium pump is an example of active transport, wherein cell energy is used to move ions across membranes against diffusion gradients and the Coulomb force. Most animal cells can fire or create their own action potential. Muscle cells contract when they fire and are often induced to do so by a nerve impulse. In fact, nerve and muscle cells are physiologically similar, and there are even hybrid cells, such as in the heart, that have characteristics of both nerves and muscles. 1) Biomagnetism - The study of the production of electromagnetic and magnetic fields by biological organisms. When biological material produces an external magnetic field, this is called Biomagnetism = Magnetic Fields that the ORGANISM (ie HUMAN BODY) RADIATES OUT. 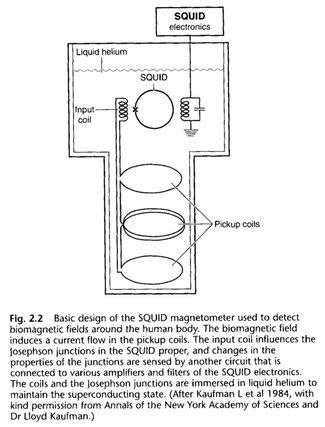 SQUID MAGNETOMETERS (MAG-NET-O-METERS). ​3) Magnetoreception - how organisms detect magnetic fields and usually how they use it for navigation (migratory birds, etc). Pioneered the field of biomagnetism. 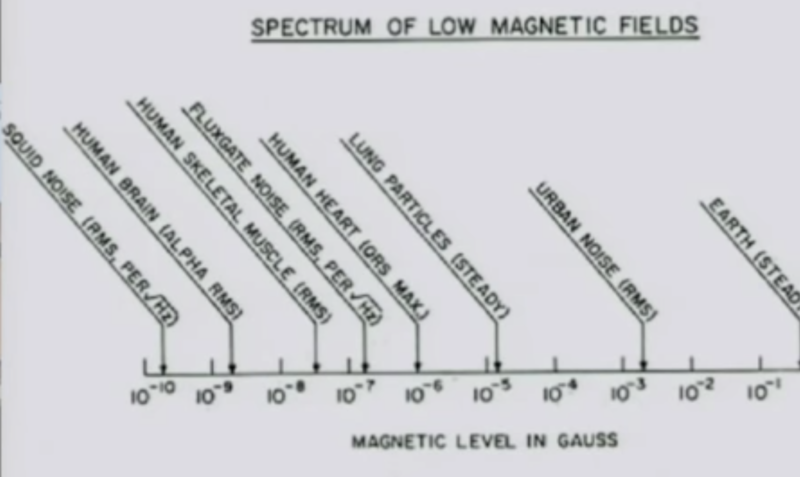 Study of magnetic fields produced by human body. He built an elaborate room that shield the magnetic field of the earth. He also built a sensitive magnetic detector to measure the magnetic fields. James Zimmerman had just developed an extremely sensitive detector called the Squid. Superconducting quantum interference device. Dr Cohen and Zimmerman set up the detectors in this shielded room to look at the fields from the heart, or the magnetocardiogram (MCG). (Mag-Neet-toe-cardiogram). And for the first time the results were clear and became the MagnaCarta of Biomagnetism ushering in a new era in the field of biomagnetism. 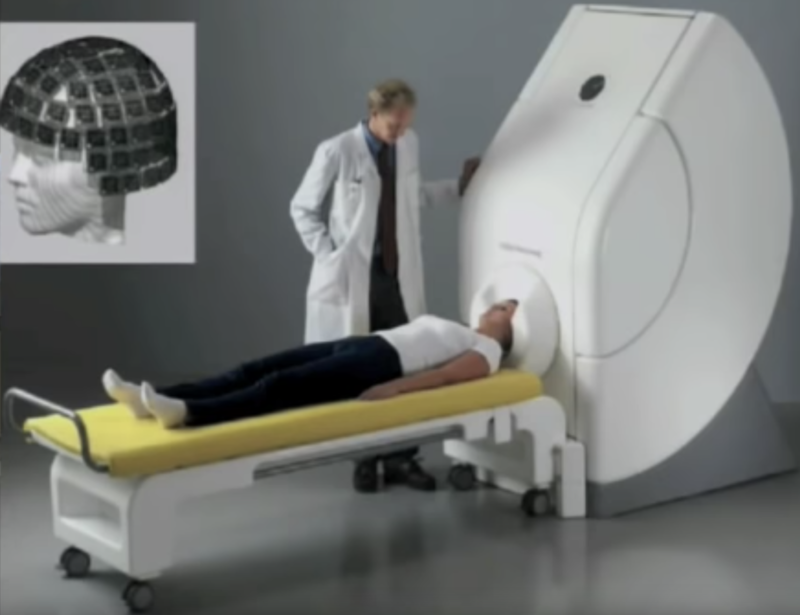 Then they measured the first clear signal from the brain which is called magnetoencephalogram (MEG). Ok, now about currents... Let this image be a blob of conductor, a piece of your arm, a piece of heart, a piece of brain, any blob. This blob is a salt water conductor. And let this be a generator, a piece of muscle or nerve and that is going to give you currents, these spin lines in the conductor. Those currents create a magnetic field outside via Ampere's law. That is how the body makes magnetic fields by currents. These same currents give you a potential on the surface that you can measure, EKG, EEG, etc but we are looking at the magnetic field that goes beyond. That is how currents in the body give you an external magnetic field. That is the basic idea. Chart below illustrates the difference between Biomagnetism on the left and Magnetobiology on the right. Interestingly PEMF ALSO Uses Current Loops like MEG and ESTIM/TENS units ALSO use Electrotrodes like EEG. In fact there are Mirror images. 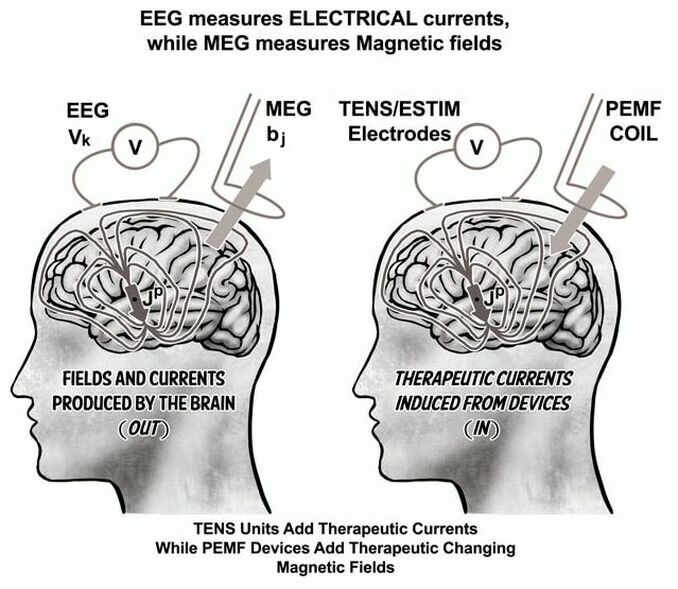 EEG and MEG uses electrodes and conducting loops respectively to DIAGNOSE (ENERGY FROM BODY GOES OUT THROUGH ELECTRODES AND CURRENT LOOPS = BIOMAGNETISM) while ESTIM/TENS and PEMF devices use electrodes and Current Loops to TREAT (ENERGY FROM DEVICES GOES INTO BODY = Magnetobiology). This is PROOF you need COILS to detect and create Magnetic fields (PEMF Devices need COILS)... Just as you need electrodes to detect and create electric currents (TENS/ESTIM need ELECTRODES). Transmitting and Receiving Antennas are isomorphic!! We'll discuss this more in the next video because there are MANY companies advertising PEMF devices THAT ARE NOT PEMF!!! (transition from Biomagnetism to Magnetobiology) It turns out that biomagnetic fields give a clearer picture of what is going on in the body than electrical measurements at the skin surface. These biomagnetic fields produced by the heart, muscles, brain and other bodily tissues pass undistorted outwards through bodily tissue. This is because human tissue is virtually transparent to magnetic fields. In stark contrast, electrical signals recorded by electrodes (ie EEG, EKG) get decreased by a factor of about 10,000 as they pass through tissues due to high dielectrics and impedances of many bodily tissues. MEG and MCG give much more detail and spatial localization than EEG and EKG. Going the other direction, PEMF will give clearer and deeper penetrating signals to the cells than TENS and ESTIM devices for the same reasons. This is why PEMF and magnetic therapy are the best of the best of energy medicine. The traditional electrical recordings, such as the electrocardiogram and electroencephalogram, are now being complemented by biomagnetic recordings, called magnetocardiograms and magnetoencephalograms. For various reasons, mapping the magnetic fields in the space around the body often provides a more accurate indication of physiology and pathology than traditional electrical measurements. Any Living Thing like a human body gives a magnetic field OUT. Here is the same scenario with the brain, here the generator is the Current, and these currents in the brain make a magnetic field, Big ARROW going out. That is being measured by some sort of coil. These currents also give potential on the head called EEG measured with electrodes. These fields are very very weak. You need a very very sensitive detector and a way to get rid of urban noise and background electromagnetic fields because magnetic fields of human body are very very weak. What is used is a sensor called a SQUID, for superconducting quantum interference device. This operates at liquid helium temperatures and can measure magnetic fields thousands of times smaller than the Earth’s. Liquid Helium dewar (high tech insulator for very cold materials). That is essential what a 1 channel SQUID detector is. It is the most sensitive detector in the world. Old shield room at MIT. Brain measured by 1 channel SQUID. 1971. BELOW: State of the art today 3 million dollars. 306 channels around the head. Note: When an external magnetic field is applied to biological material, this is called MAGNETOBIOLOGY. Magnetic Therapy and PEMF are both technically therapeutic MAGNETOBIOLOGY. The other side of magnetobiology is safety criteria in external magnetic and pulsed magnetic fields ICNIRP. That is there is GOOD and BAD PEMF. Magnetobiology is the study of biological effects of mainly weak static and low-frequency magnetic fields, which do not cause heating of tissues. Magnetobiological effects have unique features that obviously distinguish them from thermal effects; often they are observed for alternating magnetic fields just in separate frequency and amplitude intervals. Also, they are dependent of simultaneously present static magnetic or electric fields and their polarization. The sensing of magnetic fields by organisms is known as magnetoreception. Biological effects of weak low frequency magnetic fields, less than about 0.1 millitesla (or 1 Gauss) and 100 Hz correspondingly, constitutes a physics problem. The effects look paradoxical, for the energy quantum of these electromagnetic fields is by many orders of value less than the energy scale of an elementary chemical act. On the other hand, the field intensity is not enough to cause any appreciable heating of biological tissues or irritate nerves by the induced electric currents.